The Oregon Employment Department released the preliminary March employment estimates today. On a seasonally adjusted basis, total nonfarm employment in March was 1,590,400, a decrease of 400 from February and nearly the same level as December 2009 (down 100 jobs). The major positive contributor industries to the March report are Manufacturing (+1,100 seasonally adjusted) and Government (+600), while the Educational and Health Services (-1,000) and Other Services (-800) industries saw employment decline. “While we would like to have seen positive job growth in March, the estimates are consistent with the view that the job losses are bottoming out,” said Oregon’s State Economist, Tom Potiowsky, referencing the fact that the average job loss over the past six months is 650, whereas the previous six month’s losses averaged nearly 5,600. On a year-over-year basis, employment fell 37,400 between March 2009 and March 2010, or 2.3 percent. The first quarter of 2010 saw a decrease of 800 jobs compared to the fourth quarter of 2009. This marks the eighth consecutive quarterly decrease as the first quarter of 2008 was Oregon’s peak employment. On a monthly basis, employment in Oregon peaked in February 2008 and has declined in 24 of the 25 months since. Total job loss since peak employment is 148,700, or 8.55 percent. 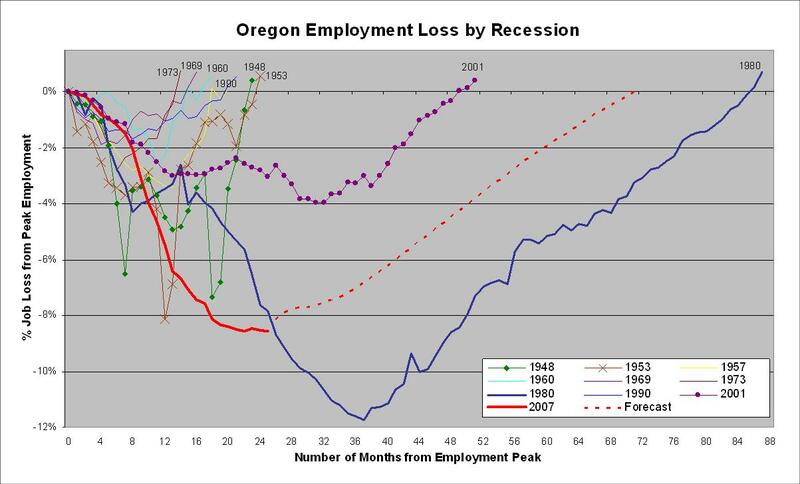 This makes the current recession the deepest employment recession in Oregon through the first 25 months (see graph below). Twenty-five months into the early 1980s recession, Oregon employment fell 7.8 percent or a total of 83,900 jobs – Oregon’s total population and workforce population were significantly smaller three decades ago. All told, employment fell nearly 12 percent between late 1979 and late 1982, or a total of approximately 126,000 jobs. The current recession has seen a larger total loss of jobs, however as a percentage of the total peak employment, job losses this recession are forecasted to be smaller than in the early 1980s. One sector adding jobs is the federal government, due to increased temporary hiring for the decennial U.S. Census. At the national level in March, 48,000 employees were added for the Census. There will be additional, temporary hires in the coming two months before these positions are eliminated throughout the remainder of the year. These workers are primarily tasked with collecting and verifying information related to the Census questions. 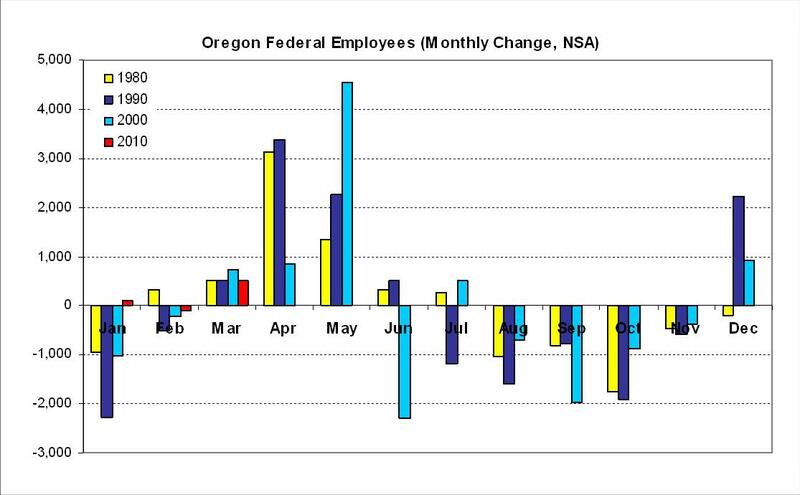 In Oregon, on a non-seasonally adjusted basis, Federal Government employees increased by 500 from February to March. The graph below illustrates the monthly changes in Federal Government employees in Oregon during the recent census years. Our office’s forecast projects, in terms of magnitude, an increase slightly stronger than the 1980 or 1990 census hiring, but less than the 2000 hiring levels. These additional hires are expected to positively impact the monthly employment report in both April and May but will negatively affect the report through the second half of the year. One important note: the data used in the graph below represents total federal government employment in Oregon and is not exclusively related to the Census, however the changes (both increases and decreases) are larger in Census years due to the temporary nature of the positions. The Oregon Employment Department notes that Census specific hirings totaled 930 through March, including an increase of 428 from February to March. Also included in the March report was the unemployment rate estimate. On a seasonally adjusted basis, Oregon’s unemployment rate was 10.6 percent in March, essentially unchanged from the revised 10.5 percent in February. The unemployment rate in March 2009 was 11.2 percent. The unemployment rate is based on what is commonly referred to as the “household survey”, which provides monthly estimates on the number of labor force participants and the levels of employment and unemployment. 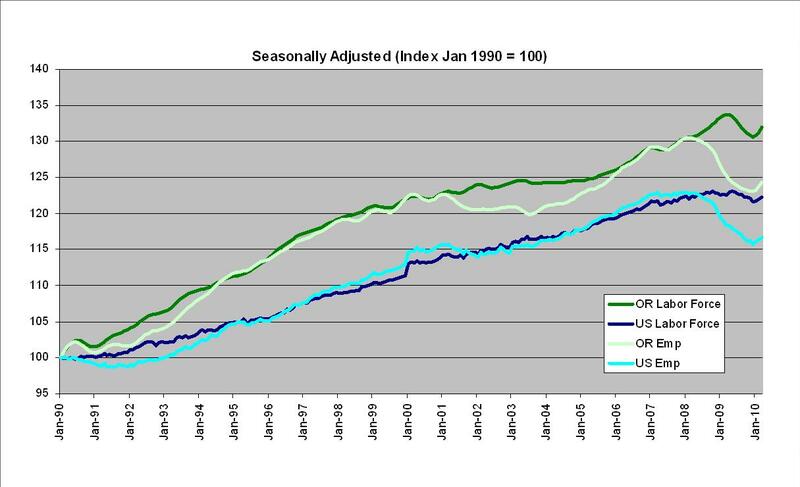 In the first three months of 2010 the level of self reported employment in the household survey has increased (light green line), as has the number of individuals seeking employment. The increase in the unemployment rate from February to March is a result of the number of individuals seeking work (labor force) increasing more than the number of individuals who reported that they were employed. The labor force increased by 17,259 while the number of employed increased by 6,983. This discrepancy led to the 0.1 percent increase in the unemployment rate. The increase in the labor force is expected – as the job market improves, more individuals will return to the labor market seeking work. Some of the increase in the labor force will be new entrants (recent migrants and/or students who finish school) and some will be individuals who previously stopped looking for work, but are now returning. The Oregon Employment Department notes in its report that the labor force participation rate is increasing, “meaning that a higher proportion of adults are joining the labor market.” This is expected to continue in the coming year, helping to keep upward pressure on the labor force number and even as jobs are forecasted to increase through the rest of the year, the unemployment rate is expected to remain at an elevated level. The graph below compares the relative changes in Oregon’s labor market with the national labor market from Jan 1990 through March 2010.